Etihad Credit Insurance (ECI), the UAE Federal export credit company, has signed a memorandum of understanding (MoU) with First Abu Dhabi Bank (FAB) to assist UAE-based exporters and local businesses in managing their trade finance needs and to support their international expansion ambitions. FAB is the UAE’s largest bank and one of the world’s largest and safest institutions. This collaboration is a solid step towards supporting local businesses and their capability to trade globally as well as to encourage them to strengthen their position regionally and internationally, in line with the country’s diversification strategy, said a statement. Under the MoU, both the institutions will collaborate in jointly developing products and solutions that will allow UAE-based exporters and local businesses to mitigate commercial and political risks associated with international trade activities while supporting their financing needs, it said. Other areas of cooperation include the provisioning of conventional and Murabaha trade credit insurance, credit risk and supply risk solutions, export and SME financing, factoring, and Letter of Credit confirmations, it added. 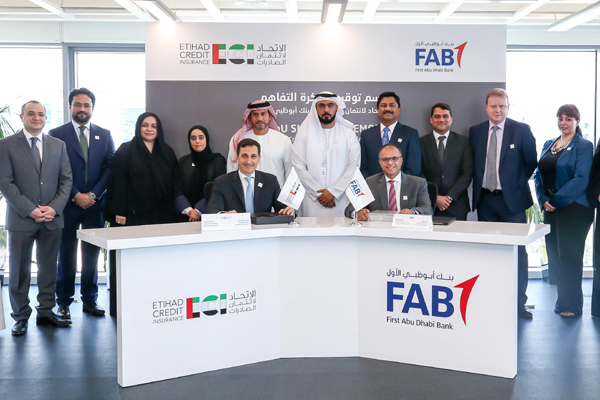 “Our recent partnership with FAB, the UAE's largest bank and one of the world's largest and safest financial institutions, is a major milestone for ECI. This alliance supports ECI’s mandate of assisting UAE businesses and exporters in driving further growth and trade activities, as well as to strengthen its commitment to support the country’s Vision 2021 programme,” he said. “Moreover, we are certain that this collaboration, through the use of innovative tools and solutions, will help track and forecast the cash flow needs of UAE-based exporters and local businesses that are looking to expand regionally and internationally,” he added. “In association with ECI, this agreement enables us to provide businesses with easier access to capital when they look to trade. Our services will not only strengthen these companies locally, but also provide them with the tools and means to expand beyond boundaries to secure new growth opportunities internationally,” he added.